In the middle of a front end seal, waterpump and belts job on my 944 Turbo and wanted opinion on replacement of the spacer bushes. On the camshaft spacer bush I cannot feel a ridge with my nail even though there is a line marked into the surface (right bush in photo). So replace all three or just the balance shaft spacer bushes? I would replace them all. I had the camshaft one leak with only a slight groove. You're almost there. It's a lot harder to replace afterwards. If they're out of the car, replace. Yes you are right - I definitely don't want to have to contend with that damn cheesehead / spline bolt again on the camshaft sprocket! does the oil pump drive show similar wear? I believe some motors have an odd size race so you might measure what you have prior to ordering. Mercedes makes service seals that changes where the lip rides which is pretty awesome when the ridge wont polish out with 600 grit. Haven't taken the oil pump drive out yet but I have a new one ready to fit when I get to it. I'd normally replace. 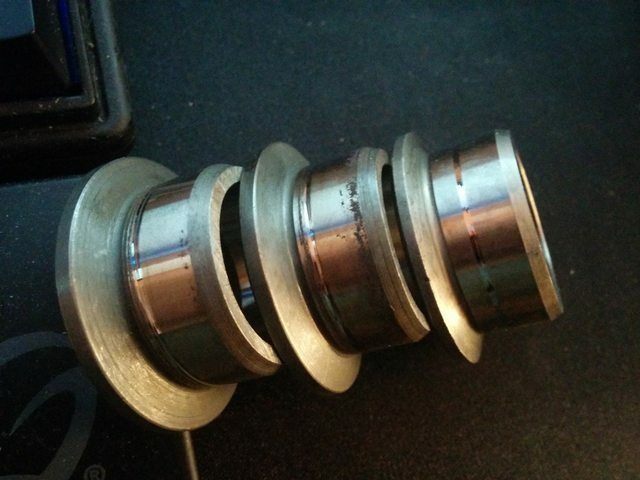 However, if you can set the radial oil seal at a slightly different depth, to run on a different part of the bushing, then that bushing can be safely reused. Good luck! Thanks Thomas - I've managed to get 1 x genuine porsche balance shaft bushing so far for £20 so pretty happy with that also can see a 2nd one for £27 and the camshaft flange is a bit more at £36.99. Problem with those sets I've seen like the one you posted is they are for the earlier cars I believe as the flanges are all the same size. Later cars have a unique camshaft flange which is a slightly different size, my turbo is a 1990 model.